Cisco Meraki's APs provide high capacity wireless in dense, demanding environments. Cisco Meraki APs are custom-designed for cloud management. Built with enhanced CPU and memory capabilities, Cisco Meraki APs deliver rich services including Layer 7 Application QoS and NAC at the network edge. The Cisco Meraki MR30H is a quad-radio, cloud-managed 2x2:2 802.11ac Wave 2 wall switch access point with MU-MIMO support. Designed for next-generation deployments in hotel rooms, university residences, and other multi-dwelling units, the MR30H provides performance, enterprise-grade security, and simple management. The Cisco Meraki MR42 is a four radio, cloud-managed 3x3 MU-MIMO 802.11ac Wave 2 access point. Designed for next-generation deployments in offices, schools, hospitals, shops, and hotels, the MR42 offers performance, security, and simple management. 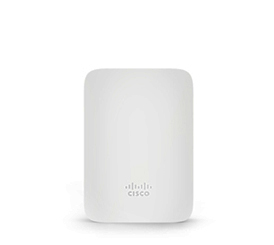 The Cisco Meraki MR53 is a cloud-managed 4x4:4 802.11ac Wave 2 access point with 160 MHz channels and MU-MIMO support. Designed for next-generation deployments in offices, schools, hospitals, shops, and hotels, the MR53 offers high performance, enterprise-grade security, and simple management.